Carel Fabritius (bapt. Feb 27, 1622, Middenbeemster - Oct 12, 1654, Delft) was a Dutch painter and one of Rembrandt's most gifted pupils. 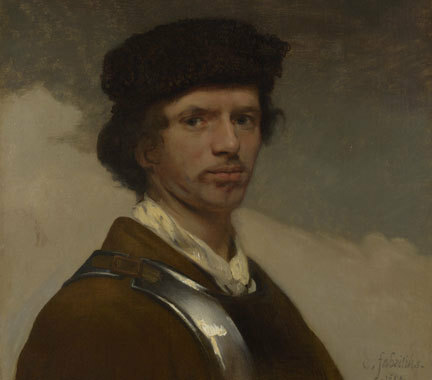 Fabritius was born in the ten-year old Beemster polder, as the son of schoolteacher. Initially he worked as a carpenter (= fabritius). In the early 1640s he studied at Rembrandt's studio in Amsterdam, along with his brother Barent Fabritius. In the early 1650s he moved to Delft, and joined the Delft painters' guild in 1652. He died young, caught in the explosion of the Delft gunpowder magazine on October 12, 1654, which destroyed a quarter of the city, along with his studio and many of his paintings. Only about a dozen paintings have survived. This view shows part of the Dutch town of Delft. It is taken from the corner of the Oude Langendijk and Oosteinde, looking roughly north west: in the centre is the Nieuwe Kerk and just to the left of it, in the distance, the town hall; both of these look much the same today. On the left, is the booth of a musical instrument vendor, with, in the foreground, a viola da gamba and a lute. The function and original display of the painting have been much debated. The picture may have formed part of a perspective box or peepshow. This would account for its exaggerated perspective, and the cutting-off of the foreshortened viola da gamba in the foreground. Such a perspective box probably had a curved back onto which the canvas was mounted. Fabritius was interested in perspective and illusionism, and is described in four documents as having made perspective boxes.